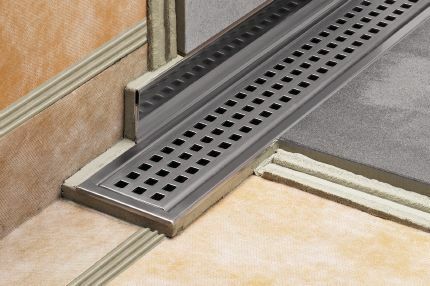 The Schluter®-SHOWERPROFILE-S system profiles represent an elegant solution for finishing the area between the floor and the first course of wall tile in a way that eliminates cutting wedges of tile and ensures a consistent elevation of the first course of wall tile in KERDI-LINE applications. 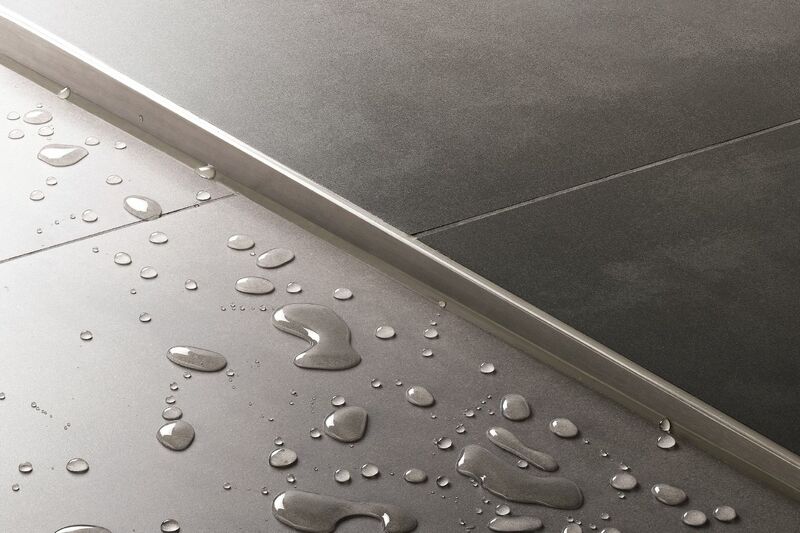 SHOWERPROFILE-S consists of a trapezoid-perforated anchoring leg with a groove, which accepts a tapered brushed stainless steel profile that matches the slope of the KERDI-SHOWER-LT/-LTS shower tray. 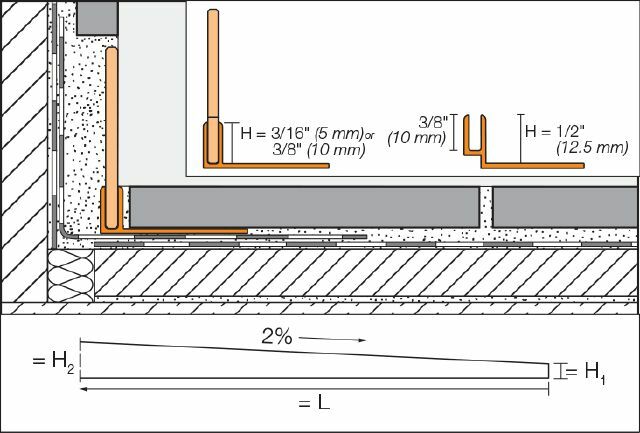 The profile is adjusted to cover the exposed wall area and forms the visible surface. 1. Measure the height of the area to be covered at the lowest point. 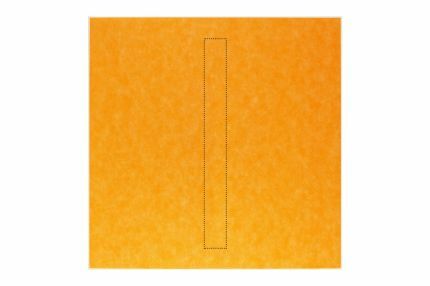 Next, measure the length of the area and mark the profile where it is to be cut at both ends. Remove the protective foil and cut the tapered profile and support section to length. 2. 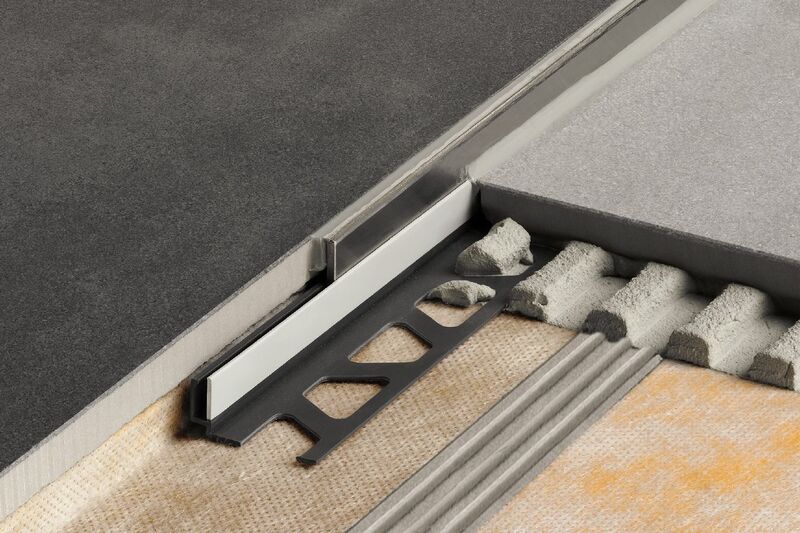 Place the tapered profile into the support section and apply Schluter-SET, Schluter-ALL-SET, Schluter-FAST-SET, or unmodified thin-set mortar to the fleece on the back side of the profile. 3. Press the profile into place and align it flush with the wall tile. Immediately clean away any excess setting material. Install adjacent tiles on the shower base. 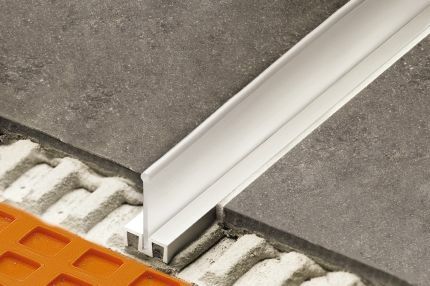 Note: The Schluter®-PROCUT-TSM cutting wheel can be used with an angle grinder set to low speed to cut the stainless steel profiles. The SHOWERPROFILE-S support section can be cut with snips. Please read and follow all safety instructions from the grinder manufacturer to prevent injury. 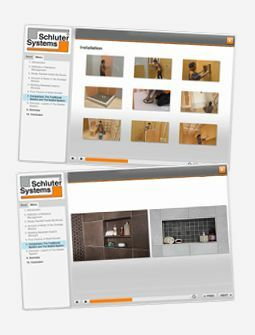 The Schluter®-SHOWERPROFILE-S requires no special maintenance and is resistant to mold and fungi. Stainless steel exposed to the environment or aggressive substances should be cleaned periodically using a mild household cleaner. Regular cleaning maintains the neat appearance of stainless steel and reduces the risk of corrosion. All cleaning agents must be free of hydrochloric acid, hydroflouric acid, and chlorides. Stainless steel surfaces develop a sheen when treated when treated with a chrome-polishing agent. Do not use abrasive or alkaline cleaning agents.